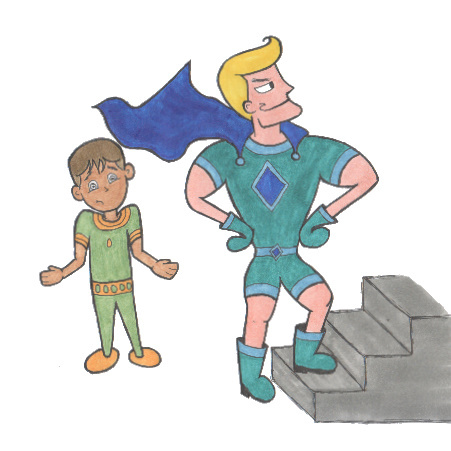 The idea for this week is a platformer where the Sidekick takes center stage and finally gets credit for all the hard work that is needed to help a superhero and save the world. Sidekicks are often overlooked in games and movies. However, sidekicks play an important role in helping save the world, without them the hero would not be able to do their job. This game focuses on sidekicks everywhere and gives them their moment to shine. You start the game as a young boy or girl who is saved from danger by a superhero. The superhero decides to take you under their wing and teach you how to save the world, starting with how to be a good sidekick. You'll learn how to navigate evil villains' lairs, how to rescue yourself (and your superhero) from certain death and how to save innocent civilians. As the game progresses you can choose the superhero you work for and therefore the special powers that you can obtain. Each level is a different super villain's lair. The lair's are built up of platforms and puzzles that you must cross and help your superhero cross safely. As a sidekick you must always enter rooms first to make sure there are no minions waiting for the superhero. Minions can usually be subdued by jumping on them or locking and unlocking doors to contain them. In each level the superhero must get to the end alive so that they can confront the super villain. While the superhero is battling the villain, you (the sidekick) must fend off the many minions who arrive. You can choose which super hero you wish to partner with and this will change the special powers that are available to you. Different super powers help you overpower minions in different ways or cross the platforms more easily. Some of the possible special powers you can get include: invisibility, power of flight, walking up walls, strength, laughter and more. Each level is themed to the super villain that waits at the end. Possible super villains include: Dr Dr Disastrous, Mr Homework, The Bad Smell and Miss Misfortune. The first lairs that you encounter require very few special powers and skills. As the game progresses and your skills increase, the lairs get more difficult to cross. Where difficulty is determined based on how hard the logic puzzles are, the number of special powers needed, and the combination of skills required. Each level will have its own unique feel based on the super villain who built the lair. Players will want to explore all the different possible levels to see the different lairs. Players will be able to customise their sidekick not just at the appearance level, but also at the level of which super powers they want to obtain. This will give players a feeling of ownership over their sidekick and help them identify with their avatar better.